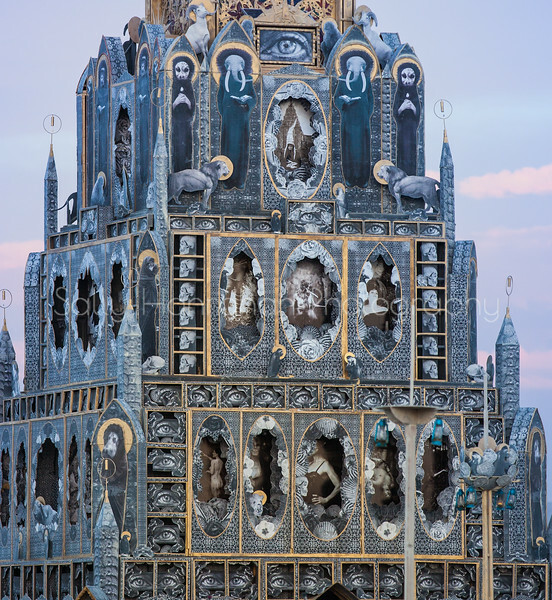 Come one, come all to the mystical Totem of Confessions, Michael Garlington’s newest Chapel! Experience cathartic release as you liberate your secrets, unearth the hidden lives of those around you, and test your fortune and powers for uncovering concealed nooks and hidden compartments holding relics and gifts from the artists’ own hands. Upon approaching the 50′ edifice, whose design recalls ancient Khmer and Vedic architecture, revelers bask in the beauty and chaos of black and white photography in assemblage with salvaged and re-purposed mixed media. In the middle of the great room, a golden confessional stands as a portal to revelation and interaction with the art and other participants. Mysteries and discoveries will reveal themselves in the installation’s details and will, in turn, inspire visitors to explore their own hidden meanings and inner worlds.